Rose and Seymour Robbins as newlyweds. Photo courtesy of Dana Robbins. It is not easy to write about a person who spoke no more than necessary and who died a mysterious and tragic death. So, I will begin by saying that my father, Seymour Robbins, known as Sim, was a quiet man, a good man, and that I cannot remember him ever shouting, except when kidding around. If he was displeased, he crooked an eyebrow or cleared his throat indignantly. When amused, he had an extensive repertoire of winks and eye rolls. I was a quiet child myself, a characteristic considered odd for a girl in a family of voluble women in the 1960s (I was born in 1957). Adults badgered me, saying things like “Why don’t you talk, little girl?” and “Where is that smile?” But my father understood. I could catch his eye across the room and we would look at each other and laugh at a private joke. When I cried, my father did not offer hollow words of comfort, just reached into his pocket and handed me his big, white linen handkerchief. As I lifted this magic piece of cloth to my face, I felt calm. That reticence, that sense of reserve that permeated my father’s being also masked a significant part of his adult life that my mother, sisters and I would only come to discover after his death from what we were told was “only” cancer in 1982. Photos do not do justice to my handsome father, debonair in a suit and hat, a twinkle in his navy blue eyes, his rosy skin, the elegant contour of his hairline framed by black hair, and his full, red lips with their pronounced Cupid’s bow. His good looks were not rugged or macho but beautiful, almost seraphic. My pretty, dark-eyed mother, Rose, met my father at a dance when she was in her late teens. He was standing on the side with a group of boys, staring at her all night, doubtless admiring her hourglass figure and smile. 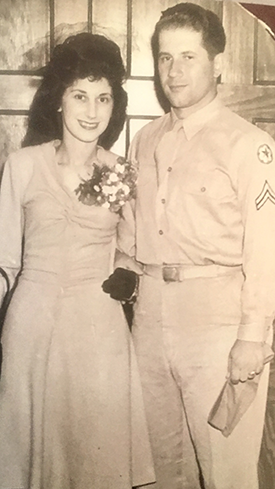 An accomplished coquette, she approached him first; they were married at the beginning of World War II and raised my two sisters and me in Teaneck, N.J.
My father learned to cook in his parents’ delicatessen. By the 1960s, when Americans discovered gourmet cuisine, he had become an epicure who communicated through food. If he served an orange, it was perfectly peeled and the segments artistically arranged. A simple sandwich from Sim was the most appetizing thing to ever happen between two pieces of bread. On Saturdays, while my mother went to the beauty parlor for a wash and set, I accompanied my father to the grocery store, where he made me giggle by doing a sort of dancing bear routine to the piped-in music. If my parents were hosting a dinner party, my father spent the afternoon in the kitchen while I hung around like a puppy, watching and nibbling. In an age when many other people ate canned peas and instant mashed potatoes, he made elaborate dishes like Seafood Newburg or moussaka. Sim, with a lunch he had just prepared. Photo courtesy of Dana Robbins. Originally, my father worked in advertising. In the 1970s, he branched off into the new field of computers, setting up trade shows and expositions overseas. Frequent business trips became a reality; specifically, he often traveled with his business partner to Mexico for shows. In 1981, my father, then 63, fell ill following a business trip to India. Plum-colored blotches had broken out all over his skin; we were told he had Kaposi sarcoma. Two years earlier, his business partner had died of the same cancer. Within a few months, Sim deteriorated rapidly and ended up in New York University hospital. His lungs filled with fluid. He couldn’t hold food down. His rosy cheeks turned pale and withered, his blue eyes dulled and sank into his face. Tests proved inconclusive. My mother, my sister Elissa and I kept vigil in the waiting room in a fog of confusion, shock and terror. The doctors told us he had cancer but wouldn’t elaborate. Every day, specialists stood at his bedside accompanied by a troop of medical residents, palpating the fluid in his swollen belly. When we asked for explanations, they answered curtly—and then literally ran away. Today, we acknowledge the impact of the disease—culturally, politically and in regards to the devastating loss of life—on World AIDS Day, held annually on December 1. But in early 1982, not much was understood about AIDS, and what was known was spoken of in whispers. Indeed, the pioneering Gay Men’s Health Crisis only began operating in January of that year. Elissa, in nursing school at the time, was curious to learn more about our father’s death and the cancer that had killed him. She obtained his autopsy report, which detailed the sarcoma as well as overgrowths of viruses and fungi. Two years later, when working in a hospital with AIDS patients, Elissa figured out the link the between our father’s sarcoma and AIDS—and the full reality of his cause of death. I wonder if my father knew and asked the doctors not to tell his wife and children. That would explain why the medical professionals seemed so determined to avoid our questions and why he was so often displayed to the medical residents—presumably one of the first AIDS cases they would have encountered. When I realized that my father had led a double life, the familiar narrative of my own life dissolved. How fitting that his career had been in advertising, which is all about creating illusion. 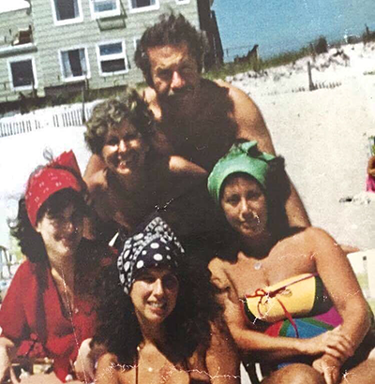 The author, at left, with her family in Beach Haven, N.J., in the 1970s. Photo courtesy of Dana Robbins. I never doubted that he died of AIDS, but my mother, for a time, maintained that he had caught something in India. Ultimately, she accepted the truth. My parents were married for 41 years. They were an affectionate couple who danced around the living room in each other’s arms when Frank Sinatra played on the radio. I believe that my father loved my mother deeply and found fulfillment as a family man, yet also had a love affair with his business partner. If Seymour Robbins was always gay or bisexual, whether repressed or closeted, I wonder how he felt growing up in the 1920s and 1930s, and as a family man from the 1940s until his death. He never seemed unhappy, just removed, somehow, or distant. It was as if his real self was buried so deeply beneath his sweet placid exterior that we never really knew him—perhaps he never really knew himself. How sad for us all that it had to be that way. As an intensely private person, my father would be horrified by this essay. I have wrestled with that but decided to “out” him from his prison of silence. For a time, I obsessed over the unanswered questions, as if acing this exam would bring him back. In this age, when all answers are a click away, my father’s life and death remain an enigma, but I have learned to love the questions. 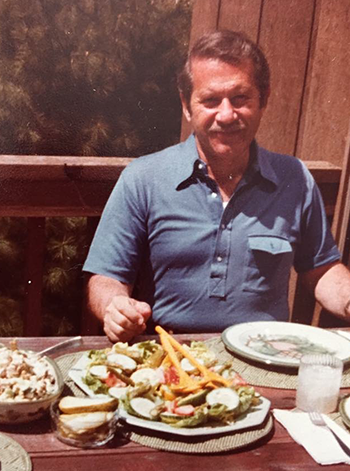 The memory of the love and sweetness that poured out of him, the orange perfectly displayed on the plate—that is his legacy. Dana Robbins’s first book, The Left Side of My Life, was published by Moon Pie Press in 2015. Her poems have appeared in many journals and anthologies. The poem, “To My Daughter Teaching Science,” was featured by Garrison Keillor on The Writer’s Almanac. Robbins had a stroke at the age of 23 and frequently writes about physical and emotional healing. What a beautiful homage to your father, Dana. We are all complex people and it is so wonderful that you appreciated Sim and all of his gifts and nuances. What a beautiful tribute to your dad, Dana. My mom, who had a rare form of cancer, passed away alone in a hospital room across the country from me. Instead of focusing on the sadness of the one day she died, I remind myself to focus on the many beautiful happy days she lived. As you are doing. I enjoyed reading your story about your Dad. Thank you for sharing your story with us. It was beautiful! !